There are very few things that make me happier than getting a package in the mail. I can trace my love of packages to my childhood. We lived in Tennessee, but my mother was from Kansas, and all her family lived there. Every so often our mailman would deliver a package from my Kansas grandmother. What joy erupted when the mailman approached with a box! Those packages offered such delight for us. They seemed like treasure chests. When I stop now to think about their contents, though, I realize that they were pretty humble. My grandmother was a school cook, not a woman of great means. She would send tiny treats--perhaps a dish towel for my mother's kitchen, a box of note cards, maybe some scented soap. She usually tucked in a little plaything for each child. And she always included some candy. But you know what was in every package? In every single box? Empty bread bags. From Rainbo bread. I can picture those bread bags so clearly! Instead of using bubble wrap or some other kind of filler, my grandmother would save the plastic bags from the loaves of sandwich bread she served in the school cafeteria. Those bread bags wrapped fragile items and provided padding for everything in those packages, and in our house my mother used them for a thousand and one things. Seemingly worthless plastic bags, otherwise destined for the trash, became the filling for those magical packages--packages that would bring pleasure and encouragement and memories that would last much longer than the trinkets they held. I decided to resurrect the fun of those packages. Last week I collected a few trinkets for a friend who's living far from home and family. 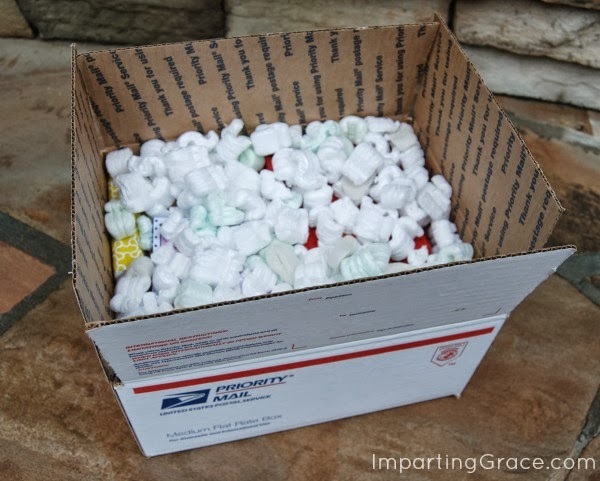 Alas, I had no bread bags, so I used styrofoam peanuts for packaging. As I placed each little item into the box and wrote a note of encouragement to my friend, I was filled with a rush of good memories. Even the chore of taking the box to the post office was an errand of happy thoughts for me. My hope is that receiving the package was a day-brightener for my friend. I know for sure that sending it was good for my soul. Turns out that sending a package is as much fun as receiving one! Most importantly was the love sent in the box! What a sweet memory to have of your grandmother and what a sweet thing to do for a friend. I'm sure she will be delighted when she receives it. Oh, Richella...I love this sweet memory of yours! My husband's mother used to send our boys little packages through the mail...like you said...small little what-nots and sweet treats. It is little things like that... that we remember and they make such an imprint on our lives and who we are! I totally thrive on these sweet memories...in fact before I started My Favorite Things, I started writing down my memories in my other blog ..full of childhood memories that were so precious to me. I wrote them down so I could go back and re-visit them whenver I got a little sentimental. Thank you for sharing your sweet memory of childhood with all of us!! Great post. What sweet memories you've shared. You are a sweet friend to send a package, too. Seems like we need to send these more often -- thanks for the prompting. I think your friend will be blessed!! I try to get a package out to my grandchildren often, but sometimes it will be a card with a bit of money in it! I loved how this post was about the wonderful memories remembered! After my mother passed I was going through her things and found a rather flat bread bag. Inside was a well read Bible (starting to fall apart) inscribed "To Bernice on Christmas. Love, Mama 1916". (I gave it to one of her great great granddaughters.) We found those bread bags everywhere. :) Thanks for your wonderful series - this one definitely touches the soul! Betty, thank you so much for sharing that story! What a family treasure you found! I guess maybe bread bags are indicative of a time when people didn't waste anything--there's a lesson for us in that, isn't there?